Thanks to characteristic Harvard creativity and the latest technology, the building where Helen Keller graduated is now on track to achieve LEED Gold certification. Built in 1806, Fay House served first as a family home, then as the original site of Radcliffe College, and now as an administration building for the Radcliffe Institute for Advanced Study. After over 200 years of piecemeal additions and alterations, the building lagged behind in both energy efficiency and safety. Heat escaped through the walls and windows while the emergency exits failed to meet accessibility guidelines outlined by the Massachusetts Architectural Access Board and the Americans with Disabilities Act. The Radcliffe Institute faced a serious challenge when it began to address these flaws last year: the historic significance of Fay House required the construction team to preserve the building’s fundamental structure and appearance. That meant typical weatherization projects, like insulating the walls to improve heating efficiency, were infeasible. Instead, the Institute had to implement more creative solutions. John Horst, Director of Operations at Radcliffe, said the only exterior features altered in the project were the deteriorating windows. Many of these were restored to their original appearance while new bronze weather stripping, interlocking channels, and a mix of interior and exterior storm windows made them more energy efficient. Inside, the innovation continued. Through a combination of simple interior design principles and technology fit for a spy film, the renovations drastically reduced the building’s energy use. Strategic wall removal let in enough natural light to work by day, while occupancy and daylight sensors dim or brighten individual LED lights based on room use patterns and distance from the window. In common work spaces, personal switches allow each employee to control the light directly overhead. In a streak of ingenuity, the lighting was also linked to the security alarm system. When the alarms turn on, signaling that the building is empty, the hallway and stairway lights turn off; when the alarms go off, whether in an emergency or for the start of the workday, these lights turn on. Outlets in the kitchen operate in a similar manner, so the coffee maker and water filters power down at night. The idea seems simple, and yet Fay House and neighboring Byerly Hall are the only buildings Horst knows that use the strategy. The ancient heating system received a makeover, as well. Jay Sisam and Kevin Bright from Harvard’s Green Building Services, described how ground source heat pumps now transfer underground heat to the building. The pumps draw well water from a depth of 1500 feet and run it through pipes that lead to fan coil units in each space. 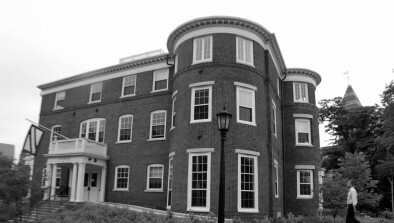 As a cost-effective and more efficient measure, Fay House was connected to the five standing column wells already in place for Byerly Hall. Heat exchangers and four additional heat pumps were also installed. The new system separates the water circulating in the ground from that in the buildings, thus ensuring a balanced load between the wells and preventing contaminants like iron particles from clogging the mechanical equipment. Besides lighting and heating, the upgrades improved energy efficiency with the installation of EnergyStar appliances and reduced water use with dual-flush toilets and low-flow bathroom sinks. The Radcliffe Institute addressed safety issues by adding a second staircase, an elevator, and entry ramps as well as using materials with low levels of volatile organic compounds (VOCs) throughout the project. Radcliffe’s most famous graduate would be proud that the building she knew so well is now a model of energy efficiency.